The Wisconsin DNR is seeking public comments on a proposed revision to silviculture guidelines for emerald ash borer (EAB). Stand-level EAB silviculture guidelines were originally released in 2007, with periodic reviews and updates. 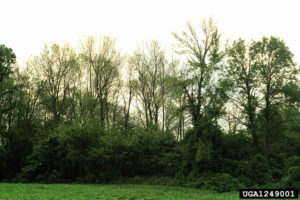 A DNR technical team and stakeholder advisory committee prepared the current version using multiple sources of information, including recent research findings, identification and locations of new EAB infestations, economic considerations, and experience gained from implementing previous versions of the guidelines. The draft document and information about the public comment process can be found at https://dnr.wi.gov/news/input/Guidance.html#open through Tuesday, October 9, 2018. All comments must be submitted by that date. The Wisconsin forestland sites monitored by the 2015 BMP teams. Coniferous trees represent sites that were in the Managed Forest Law (MFL) program and deciduous trees represent sites not in the MFL program. Note: Some dots are close together making the total number of sites difficult to determine on this map. 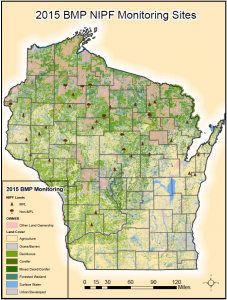 Newly-released results from 2015 monitoring for the application and effectiveness of Wisconsin’s Forestry Best Management Practices (BMPs) for Water Quality show excellent results. The effectiveness of BMPs that were applied correctly was extremely high (99.6%) at protecting water quality, but when BMPs were applied incorrectly or not applied, BMP effectiveness rates woefully dropped (6.3% and 9.4% respectively). Even with the low water quality protection of BMPs that were applied incorrectly and not applied, no major impacts were reported on any of the monitored sites. Read more details about the results from the monitoring of 36 non-industrial private forestland (NIPF) sites (26 of the landowners are enrolled in the MFL program) in the 2015 BMP Monitoring Report.